Just weeks after a New Year's Day church bombing rocked the port city of Alexandria, Egypt's religious tensions have been set aside as the country's Muslims and Christians join forces at anti-government protests. Making my way to Tahrir Square during the anti-Mubarak protests, a striking piece of graffiti caught my eye. Scrawled on the concrete pillar of a flyover was the symbol of a Muslim crescent embracing the Christian cross and the words: "We are all against the regime". During the big "Day of Departure" protest in Tahrir Square last Friday, Coptic Christian protesters made a human chain around their Muslim brothers and sisters as they performed the noon prayers. Image caption A Christian Copt holds a sign: "From Muslim and Christian brothers, Leave Mubarak you coward"
Two days later, "Martyrs' Sunday" was celebrated by Egyptians of both religions as an affirmation of national unity in struggle. On that day, a crowd had gathered in front of a sound system by the Mogamma government building on the eastern side of the square. A man in a jacket began to speak as chanting died away. "He was someone from the church, a priest," someone in the crowd told me. I was told: "We are all in this together. Muslims and Christians." Other people were listening and nodding. "One hand, one hand," the crowd roared. 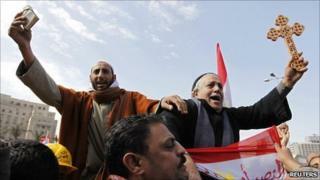 This time they were not talking about the people and the army, as they had a few days earlier, but about Egyptian unity. Muslims and Christians: One hand. The sign of the crescent embracing the cross was everywhere: From the careful calligraphy of the handmade placards, to slogans picked out in stones on the floor. I saw three elderly men, two Muslims clutching gilded copies of the Koran, arms flung around a third, hugging an ornate cross to his chest. A group of young men and women belted out a song of the 1919 revolution, accompanied by a guitar. "Arise O Egypt, arise. Arise Egyptians: Muslims, Christians and Jews." The adoption of slogans and symbols of Muslim-Christian unity is particularly important in a context where the Coptic community has been the target of a recent series of deadly attacks. Another played across Tahrir Square on Sunday commemorated the dead in a bomb attack on worshippers leaving church on New Year's eve in Alexandria. "They are martyrs for our movement too," called out a young woman. The fact that only a few weeks after the Alexandria attack, Egyptian Copts could hold public prayers in the streets of Cairo, in an overwhelmingly Muslim crowd of protesters, protected by ranks of volunteers from the Muslim Brotherhood at the entrances to the square, may indicate a shift in the atmosphere in Egypt. Some would go further, arguing that it is the Egyptian government, rather than popular anti-Christian feeling which has played a crucial role in fuelling violence against the Coptic community. "Systematic discrimination against the Copts has been common in some areas such as exclusion from top state and military positions," says Maha Abdelrahman, a lecturer on Egyptian politics and society at the University of Cambridge. "But the state's major crime has been in the way it has indirectly incited and fuelled sectarian tension between Muslims and Christians. "It has done this using its complete control over the state-run media, education and religious institutions." Despite what many see as a legacy of state-sponsored religious discrimination, the current generation of protesters can also draw on a long traditions of shared protest. The symbol of the crescent embracing the cross was the banner of the 1919 revolution against British control of Egypt, and became the badge of the nationalist Wafd party which dominated Egyptian politics until the early 1950s. More recently, explicitly anti-sectarian slogans have been adopted by property tax collectors and rail-workers during their strikes and protests since late 2007. Moreover, Copts have recently been prepared to battle the state on their own account, clashing with the police in protests over the construction of a new church in November 2010, for example. It remains to be seen whether this unity forged in struggle will strike deep and lasting roots in Egyptian society, but Maha Abdelrahman is confident that the potential for change is real. "The united front which the pro-democracy protesters have used shows that Egyptians, once united, can see through and subvert the regime's manipulation."